This is an unique speaker, here in its ‘carbon fibre’ disguise. Hey Buddy!, I found this information for you: "Wilson Benesch A.C.T. TWO". 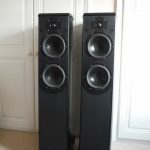 Here is the website link: https://audience.org.uk/pre-owned/wilson-benesch-a-c-t-two/. Thank you.